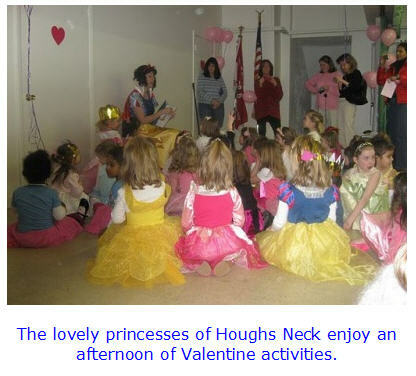 The Saturday before Valentine's Day is a sweetheart of a day at Houghs Neck Congregational Church in Quincy. Girls in the community from preschool to grade 5 are invited to dress up and enjoy tea, sweets, crafts and activities at a special Valentine Princess Tea. "Most of the girls attending wear princess costumes," said Gayle Mackay, a member of the church. "As soon as they arrive, they receive a sheet outlining all the activities, including doing a few crafts, having their nails painted, and dancing on the stage -- which is a very popular part of the event!" Crafts have included beaded bracelets, Valentine cards, crepe paper flowers, decorated crowns and wands. "I try to vary the crafts a bit each year since some girls come more than one year," she said. The character of Snow White, played by one of the adult volunteers, officially dubs the girls princesses with waves of their wands. Then the princesses visit the King (Pastor John), who gives each of them a goodie bag. Near the end of the event, the princesses all gather on the stage and Snow White reads them a story, which helps to wind down the event. "Our Princess Tea evolved over several years," Mackay explained. Presently they hold two seatings, one from 10:00 to noon and the other from 2:00 to 4:00. They can accommodate 100 people per session, and both sessions are usually filled. (The split between princesses and adults varies from session to session, but can be anywhere from 40 to 65 princesses at each session.) Admission is $10 per child/$5 per adult, and reservations are required for this very popular event. All princesses must be accompanied by an adult. "Our first similar event was a Mother/Daughter Tea -- complete with china cups. All but two families who attended were actually mothers with young daughters. So the next year, we called it a Princess Tea and it was a sell-out with a large waiting list. In fact, it was so popular we had to add another seating. Some years we even had to have two adult princesses -- Snow White and Cinderella. We used the china cups only the first year that we had two sessions. We realized that the cups didn't actually matter," she said. The china may not be used, but there are plenty of decorations. Tables and chairs are set up with pink table covers and vases with flowers. Coloring pages and crayons are placed on the tables, although the girls seldom go to their seats since they are busy with their activities. Refreshments include a pink punch, tea and coffee (for the adults), and bite-sized sweets served in paper cups. Little rose buds decorate brownies, mini cupcakes, rice krispie hearts, and chocolate dipped strawberries make everything look special. "When it comes to the refreshments, I think the adults are more delighted than the princesses," said Mackay. It takes many volunteers to put together the event. A group of about 6 or 7 meet in the church kitchen on the Thursday evening before the event to bake and decorate. A minimum of 10 volunteers are needed per session, so friends outside the church family help with the event. To keep costs to a minimum, art supplies, crafts, and goodie bag gifts are purchased post-season when items are deeply discounted. "In addition to being a great fundraiser, the princess tea is one of several ways we reach out to the community -- particularly to young families," said Rev. John Castricum, pastor of the church. "We have found that parents are constantly looking for activities to do with their children, and the tea is a fun way for parents and their daughters to enjoy a morning or afternoon together. It also draws people into our church... where they can find a positive, caring atmosphere and leave with a good feeling about who we are and what we do. Most people leave thanking us for this event, and for all that we do in the Houghs Neck section of Quincy." What better way to show your love for your community than to welcome them with a giant sparkly heart of kindness on Valentine's Day. Pastor John and Gayle can be reached at the church office at or (617) 479-8778 or hncc@comcast.net.